dear sister is not drunk, yes? 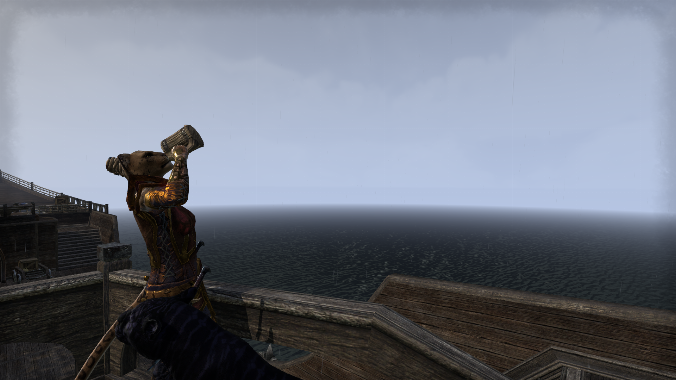 This one doupts orcish atmosphere suits a khajiit any better than drinking habits of nords. But big sister sounds cheerful. Most distant emotion for this one. In Rivenspire this one faces only ashes and decisions this one is not ready to make. There was a lethal vampire in a burned house in Hinault Farm, and this one let it escape. And watched mourning of dead child's parents. Who is to weight our choises? Guess who I met? It's Kurog, the king of orcs. I stumbled up to him in the woods, and resqued a few of his party members. Next day we talked politics in an inn. 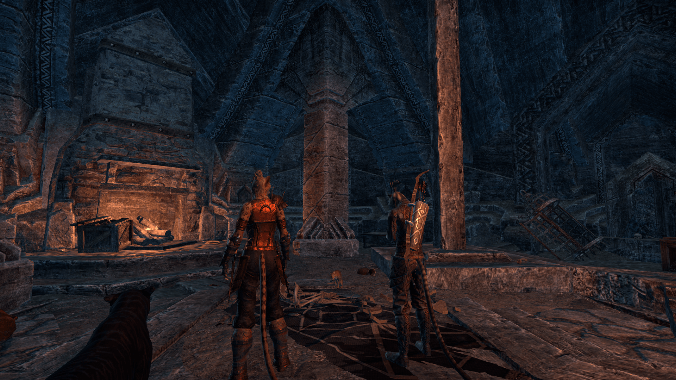 Kurog tries to gather clans to support united Orsinium. You know I don't care for those things currently. It can easily lead one to troubles. But orcs I like, and their habits. Cheers, brother, I wish to share a drink with you, too. Peace is brief and random in these days. This one crossed the borders to Rivenspire, and found nothing but dry twig and ashes in this land. Gray and empty. People are either fleeing or carrying deadly arms for protection. This one has little hope nor enthusiasm for the mission. Oddly enough, there are lots of herbs growing in this wasteland. This one will gather some and send them to Maliz. So we are all moving forward, more or less unwillingly. 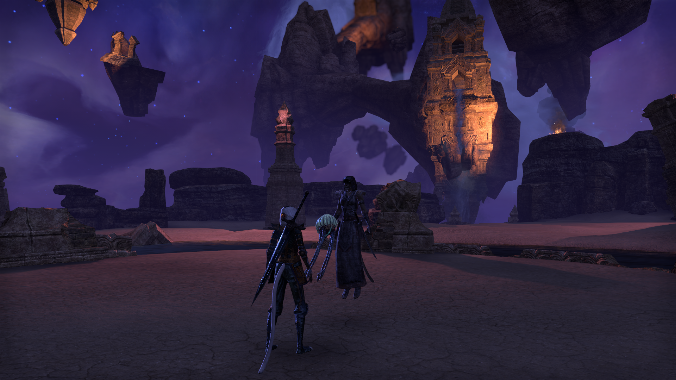 You are about to leave Rivenspire, Maliz is in Hew's Bane for the reasons that surpass my understanding. And I am hiding in the plains of Wrothgar. It was your king's men that drove me here, you did know that, no? I met a khajiit here, that was raised by orcs. Or an orc with khajiiti origins? I do not know. He – Zhasim is his name – reminds me of three of us. Heartbroken for the losts of early age. Though Zhasim gained some peace when he learned where he came from. 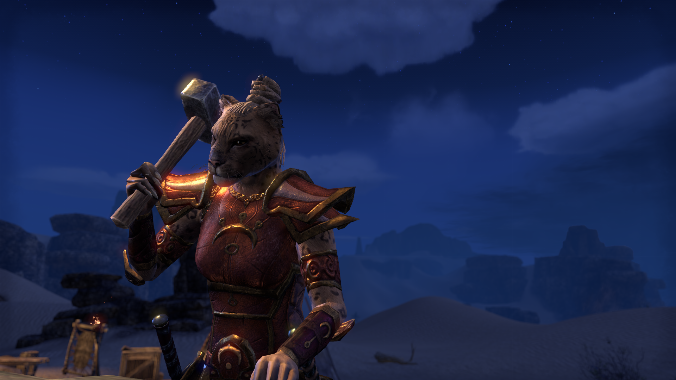 This one wonders, which makes a khajiit run faster: to catch a fortune or to get away from the past. Thank you for the staff brother J'ti kindly sent to Maliz, and apologies for the haste. This one was in a hurry to Abah's landing to attend aritual of Mara of old friend, yes. Feast of love, indeed. Godspeed to your journey to Rivenspire, may the moons watch over you, little brother. 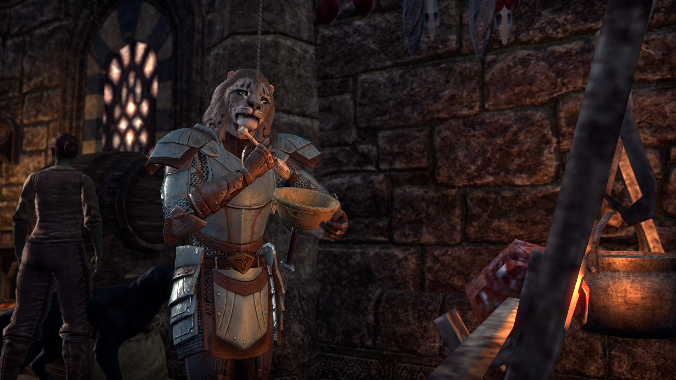 Do not be mad at Maliz, simple holiday is good for khajiit, yes? Hew's Bane is a place of many details, intriguing area truly. See, this one has found a hobby: to explore ancient ruins and dungeons, desert is full of those. Marrazz knows this, and understands, yes? This one wants to express one's humble gratitude, the sword and other equipment Maliz received are made with ineffable quality and beauty. 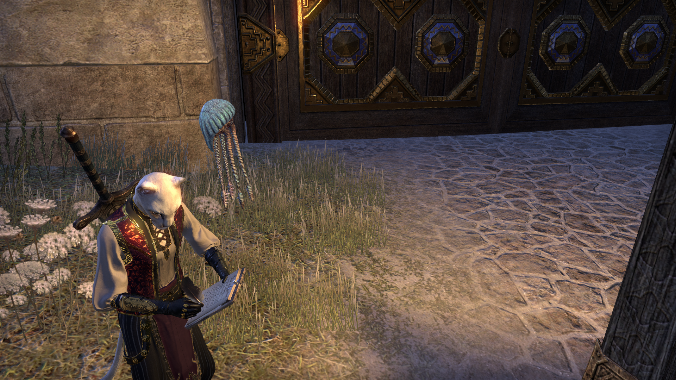 What on Nirn are you doing in Hew's bane? I hear it is dirty, hot and sandy. 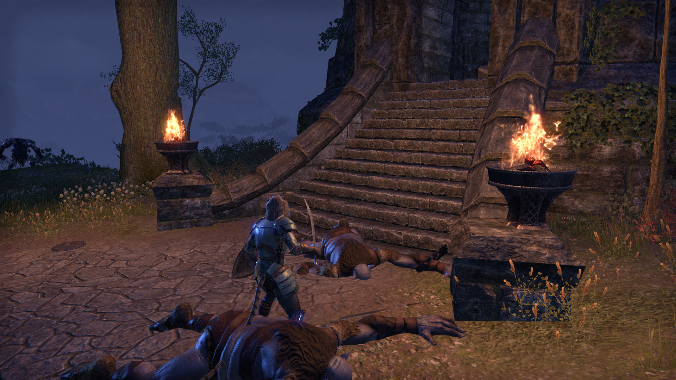 Much like Alik'r, I assume, but without traces of honor nor nobility. Well, there has been minor change of plans on my side as well. I was heading to South-West corned of Bangkorai, but my reputation proceeds me: king's men mistaked me for a spy of Queen Ayrenn. I was rather astonished, it feels like a life time since I left the lands of elves. So, I fled again, to North. I crossed the Wrothgar boarder. And here I am. Land seems vast under my feet. I'll wait here the heat to settle. Joy of finding a home elswhere was brief. King of Wayrest is already sending this one away from Stormhaven to Rivenspire. J'ti does nor complain, though it is difficult to look forward mission including vampires, that roam there. This one prefers trolls, yes. This one is also heartbroken, if dear sister travels Wayrest without J'ti to welcome her. Did Marrazz know our big sister is no longer in Deshaan. No, she travels to Hew's Bane. If Marrazz has anything to send Maliz, this one humbly suggest to address it to Mages guild in Abah's Landing. J'ti, be kind and craft a new staff for Maliz. The old one broke. This one is in a hurry. Please, send it to Abah's Landing in Hammerfell. This one has made holyday arrangements there. I am thrilled and happy. After months and months of fruitless work, my visits to Aldunz and Yldzuun were successful ones. In addition to descriptions of weapons and armour, I found texts descriping the making of dwemer shields. I copied them for you, as they made little sense to me. My search is close to fullfilment, but I do not want it to end. I have heard rumours of a place that desert folk call Razak's Wheel. Grand dwemer ruin located South-Western corner of Bangkorai. Many fear it, I try my luck, as it has been good lately. But I will stay here in the desert for a while now. I found a good place to work and test my new skills. I am making a sword to Maliz. You know, she always carries that big sword, almost size of herself, around. I guess one cannot slice skulls with magic alone. If I cannot cross the mountains, I have to travel via Wayrest and Evermore. Which is not unfortunate at all, as I can come to meet you. Your letter reached me on a splendid hour, and I wonder the omens you may sent. My visits to Aldunz was a successful one. I found fine descriptions and excamples of dwemer craft. There are few pieces of information to find and my journey is complete. This is a bright side of your dream I throughoutly enjoy. The other side bothers me greatly. Your dream was mine as well. You know I accompanied Khali to two moons path. When other sister shines the light of the moons, the other stays in the dark. I have stayed in a town of Kozanset to rest, and soon heading back to desert. To Yldzuun. May bright moons shine upon both of us. This one saw a strange dream of two sisters. Or couple of sisters. Other was the Mane and her sister, and how they ended as two sides of the moons. And then there was us. Except instead of two there was only one. Which one, moons know. This one hopes not to end up as beloved lunar champions in our journey. No, instead of ill omen, this one interprets dream as good one. In a dream the sister was wielding a dwemer sword to defeat the dark moon. Maybe this is a sign of change of luck in dear sister's research, yes? This one apologizes of lack of letters. Archmage has had plenty of petty tasks for this one. Maliz has travelled from Eachmarch to Shadowfen and back again. This one seriously considers having a holiday. The joy of meeting our brother has quickly faided as I walk these halls of dead dwemer again. Moons have turned dark. These flickering corridors are endless. All these ruins are identical. And still I feel lost all the time. It appears I'm following a trail of another adventurer. She was searching something called Guardian Eye. Her hunt seems as fruitless as mine. But atleast I get the direction where to go next. If Aldunz fails me, I will continue to Yldzuun. In my misery I like to forget that there is some progress to my work here. Ancient machines swarming here contain scraps of dwemer metal. I have dismantled many, thus I have a nice pile of material to work with in future. This one is greatly humbled for the time we spend in Sentinel, and delighted to share memories of home as well as tales of new. But honestly, after endlessly flapping winds and piles of sand in this one's ears, it is good to be back. 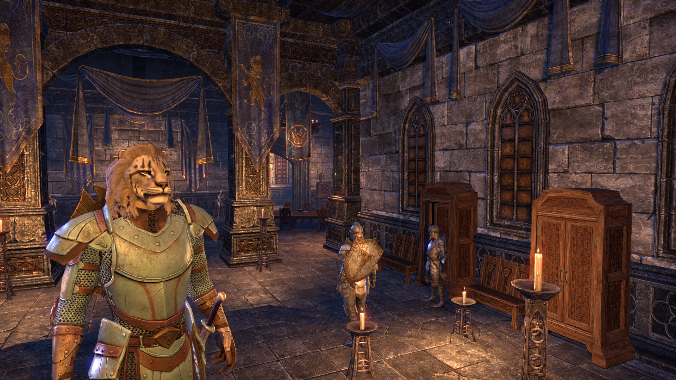 This one feels solid walls of Wayrest are good walls for a khajiit. It is not easy to find master like gra-Rug, or a king who still has work for this one. Local market place is busy like a bee hive, and monsters of the wild less tricky. It might be too early to tell, but this one feels like home in the city of Wayrest. 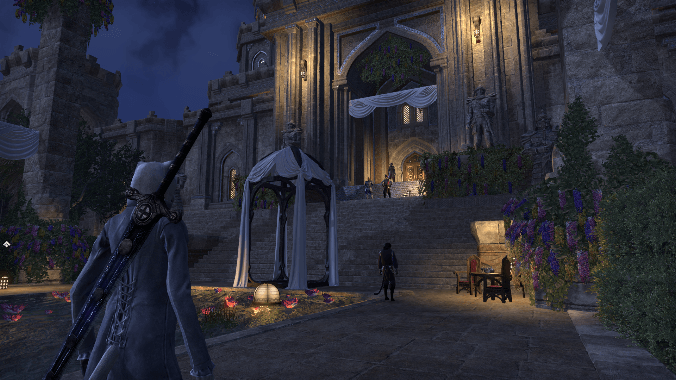 Breezes of Alik'r are turning more gentle now. I was able to return to Sentinel, and finally, after many moons, see our baby brother once again. He has grown, not very tall, but handsome, yes. Undead have left the docks, thus Sentinel is quiet again. J'ti has some time off of his duties for his masters Lagbuga gra-Rug and the king of Wayrest. We walk, chat and enjoy this time together. Yesterday evening he prepared a dinner. We sat down on the roofs of Sentinel, ate and talked about paths of fate. Ah cooking, what he calls his pursuit, is really his specialty, nothing less. He makes such a meal I feel good and strong as I never do. And it is not like I dislike his beverages, either. Tomorrow is time to part. I'll continue to ruins of Aldunz. I hope to make more progress there. You call invasion of undead minor issue? Docks of Sentinel are swarming with disturbed dead. One could not depart the ship without ten of them yearning your flesh. The problem was not the forebear but the afterbear, though. As I went slaughtering the trouble, those redguards still breathing on the docks started to attack me. Acusing me of dishonouring their ancestors!That was too much, I didn't want to kill the living. I fled to the desert. Scoping the desert was my plan in the first place. We already found ruins of Santaki, some small treasures and one wreched fait of an adventurer. 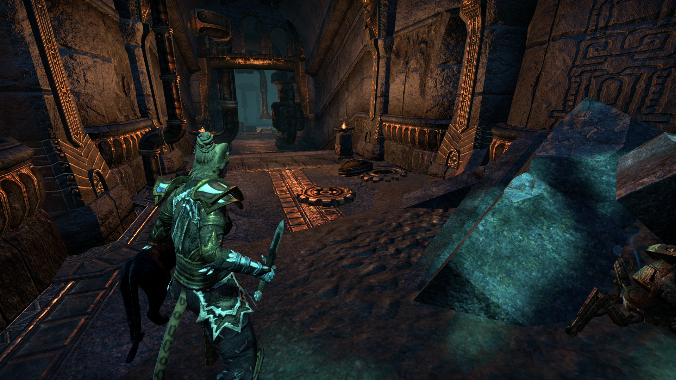 But no additional clues of craft of the dwemer. I will wait the heat to settle, then we will meet. There is a fellow khajiit called Ildani that can contact me. This one has been away to take care other duties. Archmage kindly sent Maliz to Eachmarch to study northern herbs and blood of vampire. Very spacious land this iced corner of Skyrim, lots of fresh air, yes. Some may like it, this one not so much. Glad Marrazz meets J'ti, good cub indeed. So fine and kind-hearted it makes fur frizzy. But khajiit knows it is easy underestimate him. Khajiit also thinks your taste for foreign beverage will get you in trouble any day. Sugar is better for moon born. What a coincide, J'ti is just travelling to Sentinel, aswell. Master Lagbuga gra-Rug sent J'ti there to retrieve a delivery of fine mahogany. This one has some spare time and will wait for sister's arrival. If not in Sentinel, maybe close by. See, this one goes to collect spices and makes marvelous dishes. Sometimes result it's most suprising. 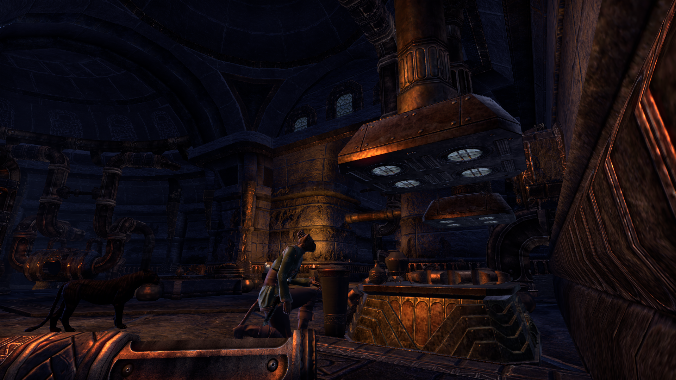 Alik'r is alluring place of craftsmen of various sorts. Wood there is excellent quality, herbs has strong wild flavour in them, and the desert itself has many secrets for those who want to learn. This one knows, that's why dear sister is coming too, yes? Be wary, though, there has been some stange going on at Sentinel's docks. Seems like ancestors of local redguards have their peace disturbed. This one hopes it's a minor issue and the dead can soon rest once more. Fifth day of our journey to Sentinel. I only remember couple. 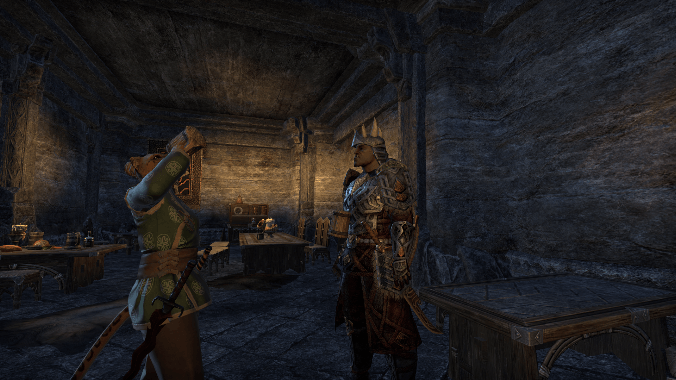 Ship’s first mate is a curious bosmer with too much Rotmeth in her trunk. Thus I’ve been drunk. So much so that I missed Anvil completely. It is a shame, I’ve heard Anvil is interesting place. I truly hope to return there someday. I’m sure I’ll be able to see our little bother. J’Ti is staying at Wayrest. He is helping the king himself I hear, such a good lad. I never thought he would leave Khenarthi’s Roost. 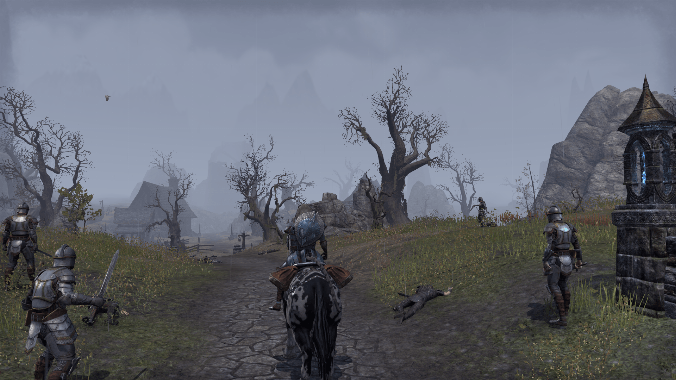 I’m on my way to Alik’r. Shadow follows me. Ship will leave soon from Skywatch, spent some days here. I don't care much of elves, but Altmer do craft beautiful shields. I found a book for you, you might find it interesting. Maybe we can meet in Sentinel. Or if you prefer I’ll meet you in Wayrest. After this journey, a ship across Iliac Bay will be effortless like creep of a whisker. I’ll write as soon as we get there. I have sweets from home. They miss us all. Small family of khajiit escape Knahaten Flu to peaceful isle of Khenarthi's Roots. One by one three remaining littermates spread around Tamriel to find their home away from home. This fiction takes place in Elder Scrolls universe, and is made with Innota. Small family of khajiit escape Knahaten Flu to peaceful isle of Khenarthi's Roots. One by one three remaining littermates spread around Tamriel to find their home away from home. 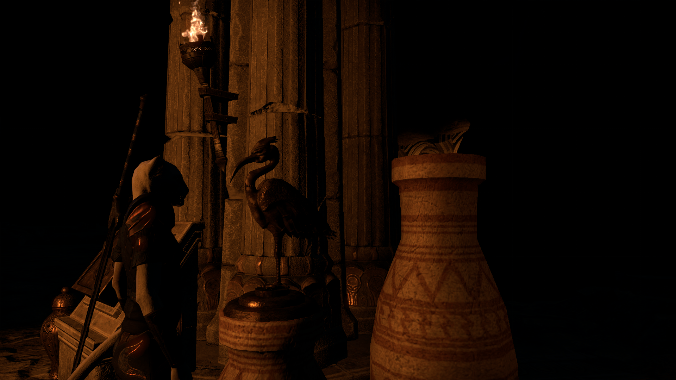 This fiction takes place in Elder Scrolls universe, and is made with [Innota](https://www.innota.co/).